Does your business comply with Canada’s new anti-spam legislation? You have until July 1 to get there. Let IT World Canada help. Obtaining explicit consent from your e-mail database to ensure compliance with Canada’s Anti-Spam Legislation. Regular updates and reputation checks of your contact list to improve its accuracy and quality. Enhance your data for an improved customer list including more up-to-date details. “A violation of CASL carries with it some significant penalties. There’s administrative monetary penalties that could levied by the CRTC up to $10 million… a single e-mail or text message in violation of the act is considered a contravention for the purpose of the penalty provisions.” – Adam Kardash, Partner, Osler Haskin & Harcourt LLP. 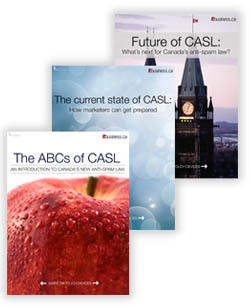 “CASL has implications for every business and organization that uses commercial electronic messages as a marketing or a promotional tool.” – Adrian Liu, Borden Ladner Gervais LLP. “Longer term, I think it’ll be helpful because you’ll have clean lists of people that really want to know about your product or whatever you’re selling.” – John Lawford, executive director, Public Interest Advocacy Centre.